I go to Target about once a week, for just about everything. Food, clothes, apartment necessities, entertainment. Where else can you get batteries, balloons, bike helmets and blueberries all at once? Actually…as it turns out…lots of places. Some of them closer to where I live, or cheaper. But just like my coffee loyalties lie with Caribou, Target is the only “modern general store” for me. Part of it has to do with the fact that I live in Minnesota — even though it’s a large corporation, Target is still a huge part of our local economy, as the cover story from this month’s Minnesota Business points out. Another part has to do with the stellar brand image. You know the one I mean. What gets me more is the marketing within the store. I can go in and aim for one thing (for instance: a black cardigan) and come out an hour later with a whole bunch of totally different things (for instance: three sets of curtains, four wash cloths, a double feature DVD of The Sandlot and Rookie of the Year, and a three pound bag of Laffy Taffy.). The signs, sales, and artwork always lead me astray from my original path. In that way, Target is like the internet: you go online to look for one thing, and a dozen other things pop up or catch your interest instead. Did you manage to get through this whole blog post without clicking on one of the hyperlinks? Have you ever walked into a Target store and come out with only the things on your list? How do you do that? I clicked on every link. I have to train myself to go with a list and stick with it. When I falter, I only “let” myself shop with cash — I know, that’s a pretty radical and non-consumer concept. How can I help the economy if I don’t spend? I just accidentally “liked” my own post because I clicked first, thought later. Again, just like how I shop. I’ve tried this “list” thing you speak of, Sara, but it doesn’t seem to be working for me. The cash thing might work, especially since I usually have less than four dollars on me at any given time. 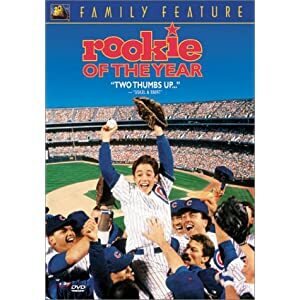 If nothing else, at least I’m keeping the ’90s-baseball-movies industry afloat. LOVE the links–and I couldn’t agree with you more about Target being like the Internet. Gets me every time.